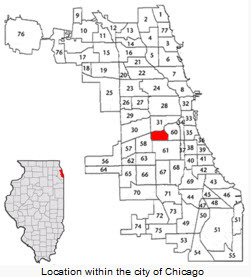 Chicago's Community Area #59 is located approximately five miles southwest of the Loop. The community and its 69 acre park takes its name from America's 35th president, William McKinley. The neighborhood was built along the Illinois & Michigan Canal and is a mixture of residential & industrial areas. The CTA Orange LIne has two stops in McKinley Park and there is an entrance ramp for I-55, the Stevenson Highway at Damen Avenue. Citywide Services provides residential appraisal service in McKinley Park. Appraisals for divorce settlements, prenuptial agreements, estate settlement, bankruptcy, property tax appeals, bail bonds and for sale by owner. Our appraisers are state certified and have experience with single family homes, townhouses, condominiums as well as small residential income properties. For all your Chicago appraisal needs contact Citywide.